For several years in my teens I struggled with a moderate fear of flying and felt not only embarrassed and ashamed but also at a loss of what to do to cure this fear. In today’s modern world, flying is part of our daily lives and having an associated phobia can have a crippling affect on not only yours, but also loved ones lives. I’m glad to say that moving halfway around the world and having to take frequent flights as part of my job (I am now a travel journalist believe it or not!) and travelling to see family and friends back home was the catalyst in changing my mindset when it came to flying and I will now happily hop on a plane and enjoy seven hours of interrupted movie time at several thousand feet without feeling the need to take a relaxant. Whilst I feel ‘cured’ I appreciate that for an alarming large statistic, flying is still something that is feared. Ahead of their upcoming Flying with Confidence course, taking place this Saturday 15th October at the Capital Club in DIFC, I speak to Captain Steve Allright who is leading the course on what triggers an irrational fear of flying and what can be done about curing it..
Hello Steve, why is it, in your opinion, that so many people are nervous of flying? Generally, there are two groups or categories of people who have a fear of flying; the first are scared of the plane crashing, while the second are those who fear that they will lose control of themselves once aboard an aircraft, for example by having a panic attack, crying, or shouting. Regardless of how the fear expresses itself, it can be very limiting to a person and often a source of deep embarrassment. When we first launched the course in the UAE in 2014, a survey we commissioned by British Airways then, showed that the primary reason people fear flying in the UAE is due to concerns about safety – 41 per cent of the people when asked, said this was their main concern. Another key reason that 35 per cent of respondents stated was a fear of the unknown. These results are not too different from the fears shared by many around the world –lack of knowledge, a combination of fears (such as claustrophobia and fear of heights) can all act as grounds for people to experience aerophobia. As we found that knowledge is a major influencing factor, the first session of our course explains the technical side of flying as well as provide expert advice on how to deal with anxiety and feelings of panic during the Flying with Confidence course. Is increased travel the best answer to curing a fear of flying? Absolutely, all feedback we receive suggests that after the course people’s confidence improves over time, each time they fly. Do you think people can be 100% cured of having a fear of flying? I’m proud to say that by the end of 2015, we helped 50,000* people over the last 30 years beat their fear of flying.! The course has an impressive 98 per cent success rate. (*This figure is based on cumulative evidence gathered from the feedback provided by candidates who have attended the ‘Flying with Confidence’ course and by the number of participants who were able to get on the flight we offer at the end of the course in most locations). Is there a particular age group that is most likely to be at risk to having a fear of flying? Fear of flying is one of the most basic human characteristics, and our participants on the course vary a lot both in age and experiences. The youngest participant we’ve ever had on the course was just five years old, while we’ve also had grandmothers participate, keen to visit their grandchildren abroad after not flying for decades. We have learnt from our participants on the Flying with Confidence course that the phobia is not assigned to a particular age or gender. Some people will perceive certain situations as more threatening than others, and the world then becomes a more frightening place for them. In your opinion do the media have a negative impact on influencing nervous flyers and perhaps people that were not nervous before? As mentioned earlier there are many reason that a phobia can arise – one is by observation. Statistically speaking, flying (aviation) is becoming safer year on year. Yet again, despite one or two high profile media aviation incidents, 2015 was in fact the safest year in commercial aviation as measured by fatalities v number of flights taken. 8.4 billion flew in 2015. I fully expect 2016 forward to be further safer due to the legislation surrounding all aspects of commercial aviation – crew, engineering and ATC training and licensing. What would be your one key piece of advice for anyone that is nervous about flying? Remember that turbulence may be uncomfortable but it’s never dangerous. Aircraft are built to withstand any turbulence they may encounter and turbulence does not threaten the aircraft’s structure. Firstly, let’s understand what turbulence is: air has fluid properties and just like a boat stays afloat on a body of water, an aircraft flies because it rests on a body of air. Water can transform from a glassy, calm surface into a rough sea, and air responds in similar ways as a result of the elements. If air is stirred up a little the aircraft experiences turbulence and will bump up and down – but the air underneath it does not go away. Control your breathing. By taking long, deep breaths, you can override the fight or flight instinct and retake control of the situation. Split a long flight up into half hour sections and go with a plan of things to do during the journey, perhaps things you never get around to doing in everyday life. Write a letter, watch a film, read a book, eat a meal. Remember that aircraft like to be in the air. They are designed to fly and commercial aircraft are incredibly well-maintained. Pilots and cabin crew like to be in the air also; it is a very normal, safe environment for them to be in. Is there anything that parents of young children can do to ensure that their children grow up to be confident flyers? The best advice is to be a good example following the below techniques to reduce your own fear or child’s fear. Make the incorporation of relaxing techniques, quality sleep, exercise and healthy eating a part of your daily routine. As many people become anxious sometimes ahead of a flight, the breathing and relaxation techniques can be used before as well as on, the flight. When you feel anxious, hold your breath, then take a long deep breath in, followed by a long deep breath out. How did you start your career in aviation? 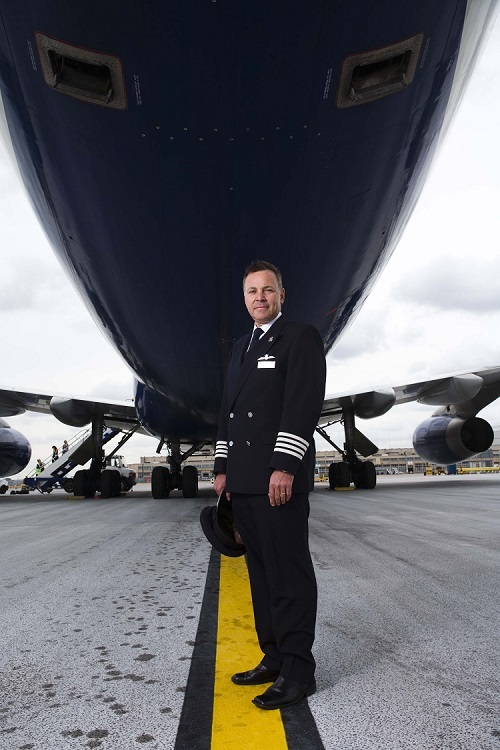 I have been a British Airways pilot for over 25 years now, clocking over 14,000 flying hours. I am also a training captain on the Boeing 747 fleet, so I spend seven months of the year flying and the remaining five months training other pilots in simulators and hosting Flying with Confidence courses in the UK, the US, South Africa and of course the UAE. I have always wanted to be a pilot since I was a little boy. The full day Flying with Confidence course will cover all the technical aspects of flying as well as the psychology and physiology of fear. During the day, attendees will receive three hours of seminars with a British Airways pilot who will explain how an aircraft flies, pilot training, turbulence, security and much more. In addition, a senior manager from air traffic control and leading phobia counsellor will both be on hand to take people through their areas of expertise.